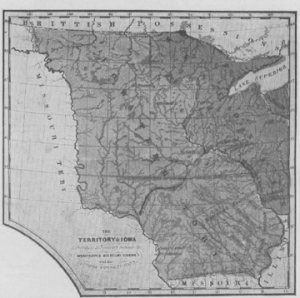 In 1803 the United States purchased the Louisiana Territory from France. Each succeeding year brought more and more pioneers to Iowa, according to the “History of Wapsinonoc Twp. and West Liberty” as published by Asa Gregg in 1878. The first settlement was known as the “Wapsinonoc Settlement,” the Indian name for stream. In their language or tongue this signifies “smooth-surfaced, meandering stream or creek.” They pronounced it Wap-pe-se-no-e-noc. The first village was located just a little northwest of present day West Liberty and was laid out by Simeon A. Bagley. This area would be where today Highway 6 intersects with Elm Street and Evans Avenue. After being surveyed by George Bumgardner, the county surveyor in 1838, a post office was established the same year with Mr. Bagley as the postmaster. His niece, Louisa Bagley Clark was given the honor of naming the post office. She said “Let it be called West Liberty”, undoubtedly named after a familiar area in Ohio. Simeon Bagley’s home was erected in the SW quarter of Section 1-78-4. He also erected a tavern on the crest of a hill just east of his residence known as the “West Liberty House”. For many years it received a large patronage, as it was a station along the stage route. A school, church and general store were erected in the vicinity of the first village. In 1855 the first locomotive wended its way westward through the corn fields where West Liberty now stands; however, only a farm house and barn belonging to Skillman Alger stood within its present limits. His home was located where our library stands at the corner of Fourth and Spencer Streets. This changed in 1856 when buildings were moved from old West Liberty closer to the railroad. Mr. Alger sold his farm so that a new town could be developed. This new little settlement was surveyed January 21st by Peter Houtz and was laid out by John W. Spencer, T. J. Robinson, both of Rock Island and J. W. Clark of Iowa City, who later collaborated with William C. Evans, one of our resident pioneers, on the sale of lots. The town was bounded on the south by First Street, on the north by the alley between Fourth and Fifth Streets, on the west being a line 320 feet west of Clay Street and on the east by the west line of Columbus Street. Between 1866 and 1869 the town improved very little. Travel was confined to the C. R. I. and P. Ry. The old freight house on Calhoun street was both passenger and freight depot. However, in anticipation of the Burlington, Cedar Rapids, and Minnesota Rail Road, of which our citizens subscribed $60,000.00 in stock to, building commenced. From this time on many houses were erected and the residential area was much improved as the town grew rapidly. 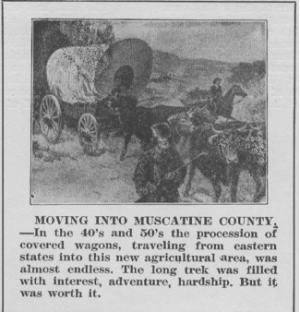 From 1889 West Liberty became a thriving town of about 2000 inhabitants, well supplied with schools, churches, and mercantile establishments; and was indeed a most delightful place to live. And here we are, 175 years later since the town was first established. According to the July 2011 Census Bureau statistics over 3,700 people inhabit our fair little town. As we approach this landmark achievement one can only guess how much more West Liberty will grow in the years to come.